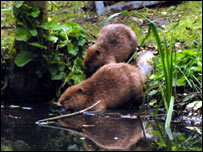 Beavers are being released at a nature reserve in Lancashire after a 500-year absence from the county. The animals, which are the world's second-largest rodent, will make their home at the Martin Mere wetland park. They are one of nature's engineers, excavating canals and building dams and lodges made from branches and earth. The display at Martin Mere will be the only attraction in the North West where visitors can watch beavers in their "natural" habitat. Centre manager, Andy Wooldridge, said: "This is something completely new to the park and the region. "Martin Mere has always been a waterfowl attraction with lots of birds, but introducing aquatic mammals will be the first step to diversifying more into a wetland attraction." The centre will house two males and two females which have come from Bavaria in Germany. They will be fed on root vegetables, leaves and fruit. A viewing lodge has been built to ensure the animals are not disturbed while they are being watched.